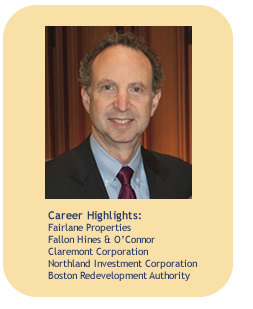 Michael Grill founded Fairlane Properties in 1997 to purchase and actively manage commercial real estate in the Greater Boston area. Fairlane has consistently provided individuals and corporations with superior returns on their investments. Mr. Grill’s unique and wide-ranging skill set includes hands-on entrepreneurial experience in acquisitions and sales, leasing, asset management, construction management, property management, equity and debt financing and government relations which has enabled him to complete over 100 sale transactions since 1980. As President of Fairlane, Mr. Grill raised approximately $25 million in equity and purchased ten properties totaling over 945,000 square feet with an initial sales price of approximately $86 million. He has arranged debt financing for over $66 million, negotiated over 150 leases and managed capital and tenant improvements totaling over $8 million. From 2003 to 2006, with Fairlane Properties acting as asset manager for BlakelyStern Investment Advisors, LLC of New York City, Mr. Grill supervised the property management, construction management, lease negotiation, reporting and budgeting oversight for approximately 500,000 square feet with over 70 tenants in 9 retail, office, flex and industrial properties in Maryland, Connecticut and Massachusetts. From 1990 to 1996 at Fallon Hines & O’Connor, Mr. Grill brokered the sale of 40 office, retail, R&D, industrial and multi-family properties totaling over 3.1 million square feet, almost exclusively in Greater Boston, with total consideration in excess of $230 million. Clients included Archon Group, Barclays Bank PLC, Campanelli Companies, The Hamilton Company, MetLife, MGI Properties, Oxfam America, and The Travelers Realty Investment Company. Prior to 1990 at Northland and Claremont, he was responsible for the acquisition of 28 office, retail, R&D and industrial properties in five New England states, totaling almost one million square feet of existing buildings, 400,000 square feet of rehabilitated properties and new construction as well as over two million square feet of planned development. Additionally, he served as a financial/legal consultant to the Boston Redevelopment Authority. A graduate of SUNY at Albany, Mr. Grill has a city planning degree from Harvard University and a law degree from Boston University. He has served as President of the Massachusetts Chapter of NAIOP (National Association of Office and Industrial Properties), Chairman of Jewish Vocational Service, Inc. and board member of Combined Jewish Philanthropies. Mr. Grill is a Massachusetts-licensed real estate broker and a member of the Massachusetts Bar. He lives in Newton, MA with his wife and two children. Hillary Brown focuses on leasing, brokerage, and asset management at Fairlane Properties. With her positions at regional, national and international companies as well as municipal and not-for-profit board experience since 1985, Ms. Brown brings a wide-ranging skill set in commercial real estate to Fairlane. 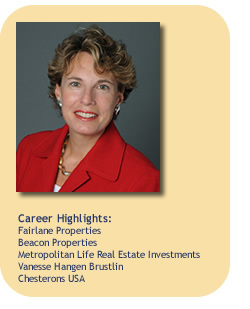 In her role at Beacon Properties, Ms. Brown served as an Asset Manager for a 22 million square foot portfolio. She completed portfolio-wide projects such as hold/sell and development analyses, joint venture valuations, income maximization forecasts and directed the portfolio-wide leasing budget process. As Director of Leasing, she represented Beacon in new leases and renewals at Russia Wharf and Two Oliver Street, office and retail properties totaling 533,000 square feet in downtown Boston. She leased 276,000 square feet in 70 transactions and performed leasing-related due diligence work for prospective acquisitions. Prior to her work at Beacon, Ms. Brown was a Senior Asset Manager at Metropolitan Life Real Estate Investments. She managed all strategic decisions, valuations, leasing, management, acquisitions and sales for Metropolitan Corporate Center and Applebriar Apartments in Marlborough and Northborough, MA. Properties included 615,000 square feet of office/R&D buildings, 164 apartments and 900 acres of undeveloped land all valued at over $75 million. She negotiated and executed leases totaling 400,000 square feet at Metropolitan Corporate Center. She restructured leases for struggling tenants, received real estate tax abatements, resolved creditors’ claims to a bankrupt tenant’s assets, and thwarted city eminent domain efforts by providing easements to abutters of Metropolitan Corporate Center. Ms. Brown worked as an urban planner at Vanasse Hangen Brustlin (VHB), writing environmental impact reports and preparing permits and approvals for major urban waterfront mixed-use developments. At Chestertons USA in New York, Ms. Brown was an acquisitions assistant and asset manager. She worked on maximizing the operating performance of the Church of England’s 12 office and industrial properties nationwide worth $150 million and totaling two million square feet. Ms. Brown earned a Bachelor of Arts degree in English and Economics at Barnard College, Columbia University. She serves on the City of Newton Zoning Board of Appeals and has been a member of New England Women in Real Estate since 1987. She was a member of The Winsor School Board of Trustees in Boston from 1993-1999 and is currently a corporator at the School. She also serves on the Board of Trustees of Temple Shalom of Newton. Ms. Brown is a Massachusetts-licensed real estate salesperson.